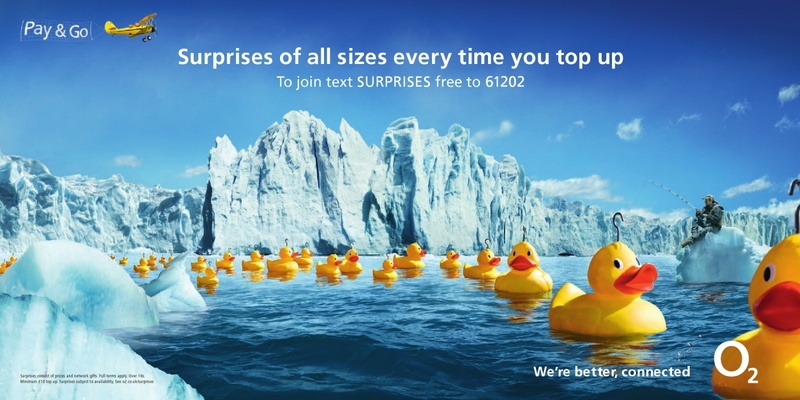 The tag line used across the campaign is “Surprises of all sizes, every time you top up”. The TV advert shows the journey of the campaign’s rubber ducks from the Antarctic to the Amazon and finally to a pond in the UK where they are hooked by a fisherman. Pedestrians will notice specially fitted bus stops with panels filled with water and ducks that quack as they walk past, thanks to their sonic sensors. O2 have developed an exclusive tie-up with the social networking site, Bebo, in which members who become friends with ‘O2 Top-up Surprises’ will be able to win ‘luv’ by spotting hidden ducks around the Bebo site. 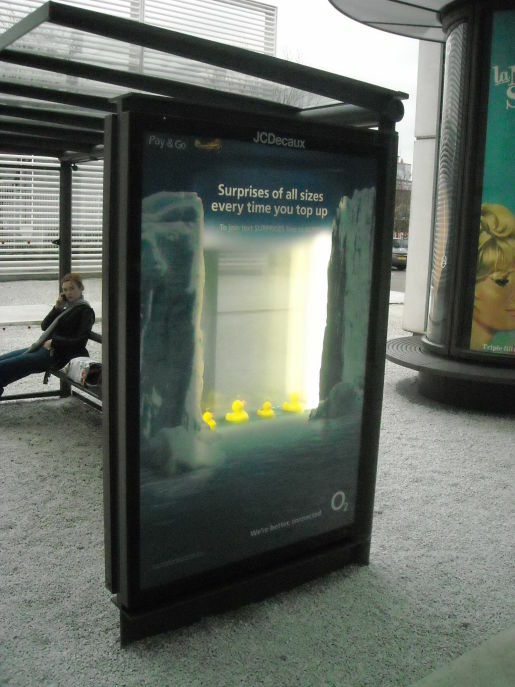 The O2 Ducks campaign was developed at VCCP, London, by creative director Darren Bailes, art directors/copywriters Ben Daly and Nathaniel White, agency producer Olly Calverley. Filming for March of the Ducks was shot by Charlie Crane via Knucklehead with director of photography John Barr and producer Bruce Williamson. Editor was Richard Orrick at Work. Sound was designed by Anthony Moore at Factory Studios. Music is by film composer Christopher Slaski. Still photography is by Roman Dietrich.